(Compiled from Sara Boboltz, Huffington Post and Susan McFarland and Danielle Haynes, UPI) – President Donald Trump said Friday that he had signed the 2,232-page, $1.3 trillion spending bill that the House and Senate approved this week, [which] fund the government through September. The announcement came hours after the president threatened to veto the bill because it did not provide enough funding for his border wall or a solution for immigrants brought to the country as children under the Deferred Action for Childhood Arrivals, or DACA, program. “As a matter of national security, I’ve signed this omnibus spending bill,” Trump said. “There are a lot of things I’m unhappy about in this bill. There are a lot of things we should have in the bill,” he added. “I’ll say to Congress, I will never sign another bill like this again. I’ll never do it again. Nobody read it. It’s only hours old. “So while we’re very disappointed in the 1.3 trillion, there’s nobody more disappointed than me because the number is so large…. We had no choice but to fund our military because we have to have by far the strongest military in the world. And this will be by far the strongest military that we’ve ever had. So when you look all of these pages, a lot of that is devoted — a lot — to the military. “Our military will be far superior than to any military anywhere in the world. That’s very import for us. You see the players out there, you see what we’re dealing with [North Korea, Iran, China, Russia, other rogue regimes, various terrorists…]. The bill provides $1.6 billion for border security measures including secondary fencing, levee fencing, pedestrian fencing and replacement fencing. Yet that amount falls far short of the $25 billion the White House had requested to construct a full wall along the border between the U.S. and Mexico. The package also provides a 2.4 percent pay raise for the military and a 1.9 percent increase for civilian government employees. It allocates $144 billion for Pentagon spending, along with increases for both U.S. Customs and Border Protection and U.S. Immigration and Customs Enforcement. Along with money to boost the military, the package includes $2.8 billion to fight the opioid epidemic and pay for more than $21 billion in infrastructure projects. The bill also includes about $700 million for election security, giving more money to the FBI to better conduct counter-intelligence to fight Russian cyberattacks. It also includes an effort to strengthen the background check process for gun purchases. The bill landed on Trump’s desk six months after it was due, and around two days after it was first introduced. Congress passed five continuing resolutions to keep the government funded while Republicans and Democrats negotiated priorities. Gridlock resulted in two brief shutdowns earlier in the year. The president called on Congress to end the practice of delaying votes with filibusters [so the Senate could pass a budget with a simple majority] and to [give him line-item veto power on the budget, which would] grant him the power to reject individual provisions of government spending bills so he could prevent future budget problems. According to Trump, only President Barack Obama has signed a larger spending bill. “And I’m sure he wasn’t too happy about it, either,” Trump said. The spending bill passed the House 256-167 on Thursday, and passed the Senate 65-32 early Friday. 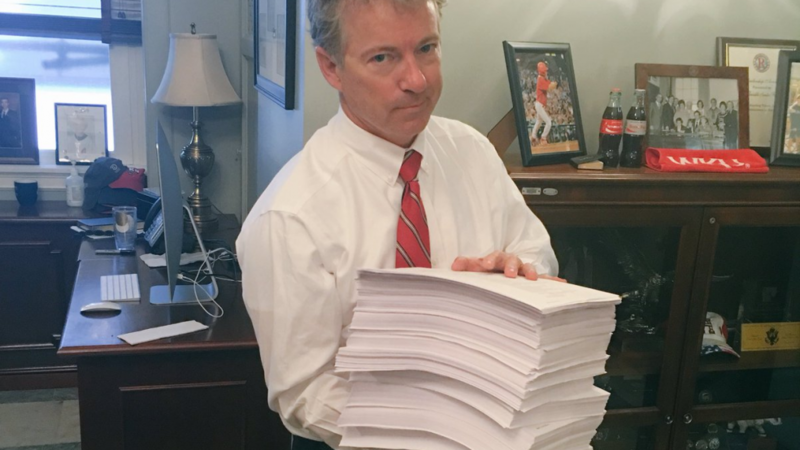 Sen. Rand Paul holds the spending bill: $1.3 Trillion, 2,232 Pages, One Messy Process. Compiled from reports at Huffington Post and UPI. $23.8 billion to procure 34 Navy ships. Our Navy is at about the lowest point in terms of ships that it’s been in over 100 years. And we’re adding a significant number of extremely advanced vessels. $10.2 billion for 90 F-35 aircraft. That’s the most sophisticated aircraft in the world, jet fighters. They’re hard to find, they’re hard to see, therefore they’re hard to beat. It’s very tough to beat a plane when you can’t see it. This is the most advanced in the world. $2.9 billion for 15 KC-46 tanker aircraft. The tanker aircraft is very important based on everything. It allows our planes to travel anywhere in the world without landing. $1.8 billion for 24 FA-18F super hornet aircraft fighter jets. $1.7 billion for 10 poseidons. Incredible stuff. $1 billion for the black hawk helicopter, fighting machine. $1.1 billion for the upgrade of 85 Abrams tanks. We’re spending tremendous money on missile defense. You understand what that means? Everybody does. With what we have out there [threats from Iran, North Korea, China, Russia, rogue regimes and terrorists], missile defense is very, very important.